Click the links below to view individual Sabbat pages. The most important thing to understand about the eight Witchcraft Sabbats is that they are not man-made. By this, I mean that they are not holidays in the same way that Independence Day is a holiday, i.e., a calendar anniversary of some date that has a special importance in history. Indeed, the Sabbats of Witchcraft do not commemorate any historical event and are, as we shall see, almost antithetical to the concept of history. Nor are they randomly chosen holidays to observe some social institution, such as Mother’s Day. No, the eight Sabbats of Witchcraft were not man-made because they existed long before man was made. Or woman. Or the dinosaurs. Or life on this planet. Indeed, these eight holidays might be said to be as old as the Earth itself. They might not have been called “Sabbats” then, but they were there just the same. The reason these holidays are so old is because they are a basic part of how the Earth works. Consequently, these holidays are not of history; they are of nature. You see, we happen to live on a beautiful blue-green planet that spins on its axis. And that axis is tilted, slightly, to the plane of the Earth’s orbit around the sun. The practical upshot of all this is that once a year, we have a night that is the longest night of the year, accompanied by the shortest day. When the hours between sundown and sunup are the greatest, and the hours between sunup and sundown are least. And we call this time the “winter solstice”. And exactly opposite it on the wheel of the year, we have its opposite, the longest day of the year, and the shortest night. And we call this time the “summer solstice”. And having got this far in our analysis of the planet’s yearly cycle, it becomes easy to spot two more days that are similar and equally important. Each spring, there comes a day when the hours between sunrise and sunset are exactly equal to the hours between sunset and sunrise. And we call this the “vernal equinox”. Likewise, there comes a day each fall when the hours of darkness and the hours of daylight are exactly in balance. And we call this the “autumnal equinox”. It cannot be overstressed that the importance of these four days lies in the fact that nobody ‘made them up’; rather, they are simply a part of how this planet works. It is reasonable to assume that even the most primitive of humans noticed this change in the hours of daylight, and the consequent change in the seasons. One can well imagine the anxiety in the mind of the “noble savage” as he witnessed the dwindling hours of daylight each autumn. And the sense of relief he must have felt when the year “turned the corner” at the winter solstice, and the days started to grow longer again, promising that spring would indeed return. Is it any wonder then that the oldest astronomical alignment of which we have a record points to the sun’s position in the sky on the winter solstice? And this is in a burial mound in Co. Meath, Ireland. In fact, the relatively new science of archaeoastronomy underlies much of what has been discovered about the Old Holidays. Megalithic sites such as Stonehenge, for example, have clear alignments to both the summer and winter solstice, and the vernal and autumnal equinox. Nor are such alignments confined to the British Isles; indeed they can be found the world over: from the pyramids of ancient Egypt to the ancient temples of China; from the cliff dwellings of the Anasazi to the temples of Peru. The two solstices and two equinoxes must certainly be the oldest holidays known to humans, and they were known worldwide. Folklorists refer to these four days as the “quarter days”, inasmuch as they quarter the year. Astrologers know them, too, for three zodiac signs fit neatly into each quadrant, beginning with the first day of Aries at the vernal equinox. And modern Witches tend to call them the four “Lesser Sabbats” or “Low Holidays”. The four “Greater Sabbats” or “High Holidays” of the Witches’ calendar may seem slightly less obvious at first. Essentially, they bisect the quarters we have already discussed, falling at the midpoint of each. For this reason, folklorists refer to them as the “cross-quarter days”. With these in place, the circle of the year begins to look like an eight-spoked wheel, which is a sacred symbol in many ancient religions. Because these four days are not as firmly marked by terrestrial events as the solstices and equinoxes, some writers have been led to speculate that they are derivative, and that their observation evolved at a much later stage of cultural evolution. Yet, although they may not be completely contemporaneous, their great antiquity was quite recently underscored by the discovery in Ireland of earthwork alignments of the sun’s position on the horizon for each of the cross-quarter days! That means that the holiday we today call “Halloween” has been celebrated as far back as megalithic times! That the cross-quarter days should be regarded as more important than the solstices or equinoxes should come as no surprise. It is a common human experience that things reach their greatest strength, their moment of peak energy, at their midpoint. In observing a human life, for example, a person is usually at the apex of health and vigor at a point about halfway through his mortality. So, too, with most other things in nature. So, too, with each quarter of the year. The cross-quarter days can thus be seen as the four “power points” of the year. 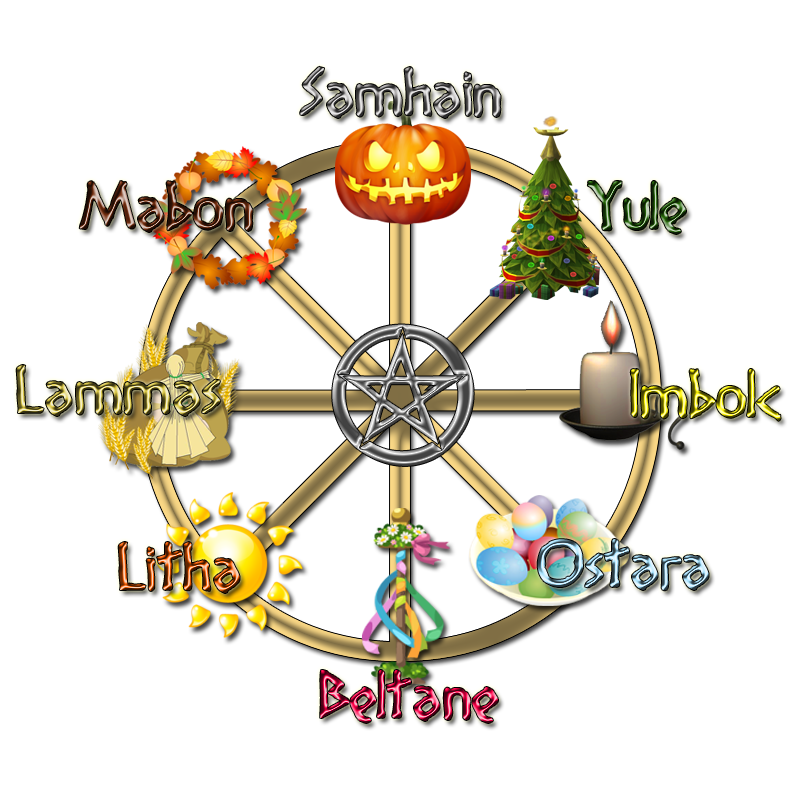 Consequently, those power points were marked by the four most important holidays of the Witches’ year which, according to the old folk calendar, also marked the turning of the seasons. These also correspond with the tetramorph figures of the zodiac, and were later adopted by Christian tradition as the sigils of the four Gospel writers. And nothing can keep a modern Witch in tune with the cycles of nature like observing the Old Holidays. I can still remember the feeling I sometimes got as a child that a particular night during the year was somehow special, charged with magic and power, alive and responsive to my inner thoughts and desires. Like Halloween night (always my favorite holiday) in some ways, but different too, and occurring at other points of the year. I never knew why such nights occurred, but I knew they had to be celebrated, by placing candles on the front porch railings, creating mysterious shadow plays where the light of an old incandescent street lamp fell on the side of the garage, or playing hide-and-seek with the neighborhood kids, the wind helping my running. Or maybe an impromptu weenie roast (always a good excuse for building a big bonfire) was called for. I can’t prove it, of course, because I didn’t keep a diary, but I’d be almost willing to bet that I had stumbled onto the Old Holidays, vestiges of their primordial power still echoing down through the centuries. Finding out more about these ancient holy days has been a lifelong labor of love for me, and I sincerely hope that the gleanings of my own research into these mysteries will kindle in my readers that same sense of magic and grounding or “connectedness” with nature that I have always experienced when contemplating the Old Holidays. Document Copyright © 1999, 2005 by Mike Nichols.